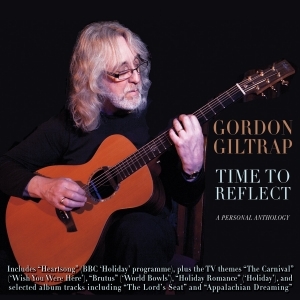 This is a very significant release from the renowned British guitarist Gordon Giltrap, who has been an established and respected figure on the international music scene for over forty years. Playing both acoustic and electric guitars, Gordon’s music transcends the genres, encompassing folk, folk/rock, progressive rock, blues and pure pop, his virtuosity always matched by accessibility and musicality. He established his reputation in the late ‘60s playing on the London scene alongside the likes of Bert Jansch, Jonh Renbourn and Mike Oldfield, and came to prominence with his ‘70s albums, notably the chart album “Perilous Jorney”, from which came the single “Heartsong” which made No. 21 in the UK chart, followed up by his second hit “Fear Of The Dark” from the album of the same name. “Heartsong” was used for many years by BBC TV as the title music for their “Holiday” programme. Gordon has compiled this 4-CD retrospective, as well as writing the substantial booklet notes, giving an insight into the background of his music from his own standpoint. It is a thoroughly absorbing, enjoyable and listenable collection, and is naturally a marvellous showcase for his unique talent and technique.